Lepidolite is a lilac-gray or rose-colored member of the mica group of minerals. It is the most abundant lithium-bearing mineral. It is a phyllosilicate mineral and a member of the polylithionite-trilithionite series.Found around the world. 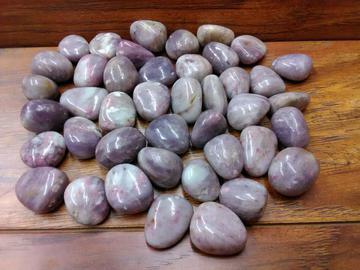 Lepidolite is used for dreamwork, rebirthing, and is also good for dream recall. It is a protection stone.